Each of the 37 (38) books comprising the “Natural History”1 have been studied and the more important geographical facts extracted. They are set out in the original text order of Pliny the Elder, and are then sequentially analysed. Where practical cross referencing occurs, but it is in fact sometimes counter-productive as Pliny sub-divides certain data which it would be thought contemporary. I have referenced my earlier texts where applicable, and there-by reduced the explanations given here-in. Those texts extensively cover all of the subject matter concerning the reference. This paper does not seek to resolve all of the anomalies found within the text of Pliny the Elder, and is followed by a second text which evaluates the map or maps available to Pliny for his text. In his text comprising 37 (or 38 Books), Pliny includes a geographical description of the oikoumene in its various parts. The text is set out in a semi logical form. Indeed, after Book 1, Book 2 is entitled, “An account of the world and the elements”, to be followed by Books 3, 4, 5 and 6 all entitled, “An account of the countries, nations, seas, towns, havens, mountains, rivers, distances and peoples who now exist or formerly existed”. In Book 2, chapter 112, entitled, “The dimensions of the Earth”, Pliny quotes Artemidorus2 (c100BCE) and Isidorus3 (c BCE/CE) regarding the length of the oikoumene. These are but two of the sources Pliny uses throughout his text. Therefore, from before our common era we have distance measures, including those of Eratosthenes4 (c285-194 BCE and explained in my texts Es1 and Es2). But, the aforementioned Geographers are prior to Strabo5 (c64BCE-25CE) and the writing of his “Geography” which is based upon the three books of Eratosthenes. Thus, it is possible that the use of at least two measurements for a Stadion6, particularly as Pliny quotes Eratosthenes’ measurement of the world, 252000 stadia, are utilized. That I have shown is based upon a Stadion of c157.5 metres. Thus when Pliny calculates that the 252000 stadia are equal to 31500 Roman miles (mpm) he has inadvertently mis-interpreted the Stadion. This fact is borne out by his quotation in Book 2:21 where he confirms the length of the Stadion as 125 Roman paces or 625 Pedes, i.e. 184.896 metres. At this period a degree of latitude was 75 Roman miles (mpm) and thus the actual figure would be 360 x 75 = 27000mpm. Pliny states that, “The attempt (by Eratosthenes) is presumptuous, but it is supported by such subtle arguments that we cannot refuse our assent”. Thus we can assume Pliny was reading the original text of Eratosthenes, where-in no doubt he explains why the circuit of the earth was 252000 stadia. But, obviously, at no time did Eratosthenes quantify the Stadion used. However it is necessary to ask, why did Pliny not recognise the conflicting distance measures? We can therefore use both Stadion’s to analyse the distance measures which are within the text, and thus conclude the measurements of the Earth as actually perceived, as well as its various parts. “The comparative distances of places on the face of the earth”, Pliny states, “Having now fully described the Earth, both without as well as within, it seems only proper that we should succinctly state the length and breadth of its various parts”. Thus my comment -semi logical- was used as the major geographical distances for the Earth or Globe and the oikoumene are scattered throughout the whole text and this is really a re-iteration. Rather than gather the disparate data together, particularly as it is attributed by Pliny to many authors and travellers, it is simpler to follow the text Book by Book and analyse each statement as it appears. Thus any particular cross referencing can be carried out to enable a complete understanding of Pliny’s vision of the Earth. To illustrate the knowledge available even prior to Eratosthenes (c275-194BCE), it is worth quoting in full the description of the oikoumene given by Herodotus7 c446 BCE. “I cannot help laughing at the absurdity of all the map-makers – there are plenty of them – who show Ocean running like a river round a perfectly circular earth, with Asia and Europe of the same size. Let me spend a few words in giving a proper notion of the size and shape of these two continents. Persian territory extends southward to the Red Sea, as it is called; north of them are the Medes, then the Saspires, then the Colchians, who go as far as the northern sea (Black Sea) where the mouth of the Phasis is. These four nations fill the area between the Black Sea and the Persian Gulf. Thence run westward two great continental promontories, one of which stretches from the Phasis on the north of the Black Sea and the Hellespont to the Mediterranean at Sigeum (Yenicher) in the Troad, and again in the south, along the Mediterranean coast from the Myriandic gulf, near Phoenicia, to Cape Triopium (Krio Isostros). This branch of the continent contains 30 different nations. The other starts from Persia, and embraces successively Persia, Assyria, and Arabia, and ends – or is assumed to end – at the Arabian Gulf (Red Sea), which Darius connected by canal with the Nile. Between Persia and Phoenicia lies a very large area of country; and from Phoenicia the branch I am speaking of runs along the Mediterranean coast through Palestine-Syria to Egypt, where it ends. It contains three nations only. Such is Asia from Persia westward; eastward, beyond Media and the territories of the Saspires and Colchians lies the Red Sea (Indian Ocean) and, at the northern limit, the Caspian Sea and the River Araxes, which flows eastwards. Asia is inhabited as far as India; further east the country is uninhabited, and nobody knows what it is like. Such, then, are the shape and size of Asia. Libya is a part of the second branch I mentioned, for it adjoins Egypt; Egypt itself forms a narrow neck, only about 120 miles across from the Mediterranean Sea to the Red Sea; but it soon broadens out, and what is known as Libya covers a very large area. The text Cp4 discusses the circumnavigation of Libya/Africa. I will now commence a general over-view analysis of the text by Pliny the Elder, but would caution all to remember the previous section. The Roman Pace or Passum is two steps, and thus five feet in length (in fact the Roman Mile is 1000 passum/5000 pedes or feet). The pace is 5 x 11.64706 statute inches or 606.615 statute feet and thus 184.896 metres. The Roman Mile is therefore 0.919118 statute miles or 1.4791 Kilometres. Within this text I use both Roman Mile and/or mpm to denote that one measure. This confirms that Pliny was aware of the PI8 ratio of 22/7, but later in his text chooses to accept PI8 as 3 and not 3 + 1/7th. “There are only two of the zones which are temperate —-. It appears, therefore, that the heavens take from us 3 parts of the earth; how much the ocean steals is uncertain”. The diagram illustrates the zones. However, a full description of those zones and the persons involved with their definition and number is to be found within “The History of Cartography”9, chapters 8, 9 and 10. It is therefore unnecessary to repeat the data. The Arabian Gulf or Red Sea is separated from the Egyptian Sea or Mediterranean Sea by the two gulfs, Suez and Aqaba, either side of the Sinai Peninsula. The former is in fact the Suez Canal and the latter basically the line of the Israeli Border. The former is 135KM or 90mpm and the latter 216Km or 146mpm. The estimate measured via the Suez Canal is quite accurate, as later diagrams illustrate. The discrepancy over just what is the Arabian Gulf or Sea continues throughout the text. The distance between the Caspian Sea and the Black Sea or Euxine is along the 42nd parallel across Georgia and Dagestan to Derbent, 540Km or 365mpm. This is a very accurate measurement. BOOK 2, CHAPTER75: “WHEN AND WHERE THERE ARE NO SHADOWS”. “It is likewise said, that in the town of Syene, which is 5000 stadia south of Alexandria there is no shadow at noon on the days of the solstice (Summer), and that a well, which was sunk for the purpose of the experiment, is illuminated by the sun in every part”. This refers to the basic experiment and distance calculation explained to us by Cleomedes, as carried out by Eratosthenes, to establish the circle of the earth (texts Es1 and Es2). The 5000 stadia would therefore be 625mpm, and this discrepancy is fully discussed in my texts. It is in fact an Eratosthian meridional measure formed from a direct measure of 5300 stadia of 0.1575KM. 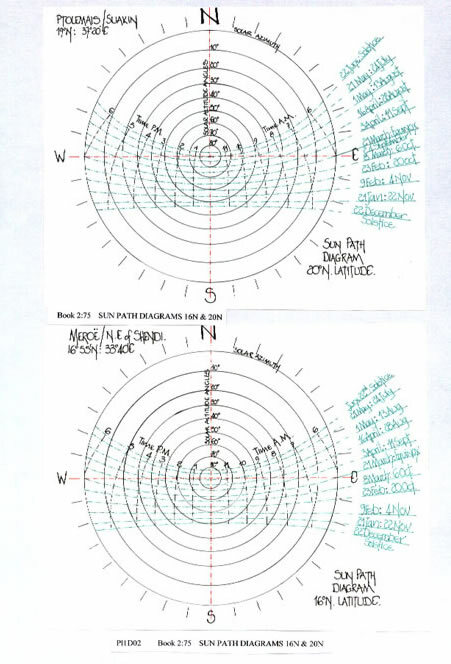 My diagram cgPl1D01illustrates the Sun’s Path for this latitude and therefore confirms the text of Pliny. However, in 6:34, Pliny states that this experiment took place on the Red Sea coast at Berenice which is at similar latitude to Syene. At Ptolemais, latitude, c200N, it has a sun path at the solstice which indicates it is 50N of East/West and thus gives a southerly shadow. But, one month earlier, 21st May, it is directly overhead. Allowing for a latitudinal reading at Ptolemais, the 45 days before the solstice is quite acceptable and the description given is thus one of fact. Diagram cgPl1D02 indicates the Sun’s Path for Ptolemais at c200N. Those dates are in fact the 8th May and the 4th August. Meroe is c800KM direct distance south of Syene (Aswan), that is 547mpm or 4377 stadia. The measurement is therefore possibly an itinerary measure crossing the Nubian Desert via Wadi Gabgaba, or it is an Eratosthian Stadion of 0.1575Km, used in the calculation which equates to a measure of c5080 stadia. It is, as I have opined in text Es2, the Stadion of Eratosthenes 0.1575Km, copied unknowingly by Pliny. He is therefore unknowingly using a measure differing from the Roman Stadion he understands. Diagram cgPl1D02 has the Sun’s Path for160N latitude, and on the 8th May it indicates the sun directly overhead at midday. But, it could also be on the 11th August. However, the measurement given must be considered excellent and a very creditable observation. From India to the Pillars of Gades (Hercules) and the Capes of Iberia was originally measured by Eratosthenes. He utilized this distance as the length of the oikoumene. He calculated a length of 73800 stadia (of 0.1575KM) and thus we may consider this as being equivalent to 62900 stadia of c184.89 metres, and thus 7858 Roman miles. Thus, the distance measure quoted of 8568 miles is not the same itinerary distance as used by Eratosthenes, but, given the similarity of the numerals it is possibly a scribal error. If the two mpm distances are converted back to Stadion measures the evidence of scribal error is indicated. The difference between the Artemidorus distance of 8568 mpm and the Isidorus distance of 9818 can thus be explained; 8568mpm = 68544 stadia and 9818 mpm = 78544 stadia, a single digit. It takes very little to cause major upsets in the investigation of ancient measures. The route from Issus to Gades given in two parts is a clue to its origin. From Issus to Caralis in Sardinia is 2103 mpm or 16824 stadia of indeterminate length. But, it can be measured and is a geographical distance of c2625km, which is 1775mpm. Therefore the measure would appear to be 16824 stadia x 0.1575Km = 2650 Km. From Caralis to Gades is 1250mpm or 10000 stadia and is thus also using the Eratosthian Stadion of c157.5 metres. It is also the distance measure utilized later by Marinus the Tyrian (Mt1 & Mt2). This itinerary route across India, although non specific, indicates that a very northerly route was taken through Parthyene. It can be plotted to investigate its veracity and through the distance measures given. This is a story which details the distance from the Ionian Sea to Susa, given as a three month travel period. But, here we read how a map was produced by a Greek to convince a Spartan that he should invade another country, Persia. Maps were obviously well known and utilized in the ancient world. “That information I will now supply myself. At intervals all along the road are recognised stations, with excellent inns, and the road itself is safe to travel by, as it never leaves inhabited country. In Lydia and Phrygia, over a distance of 941/2 parasangs – about 330 miles- there are 20 stations. On the far side of Phrygia one comes to the river Halys; there are gates here, which have to be passed before one crosses the river, and a strong guard-post. Once over the river and into Cappadocia, a distance of 104 parasangs, with 28 stations, brings one to the Cilician border, where the road passes through two sets of gates, both guarded. These left behind, the distance through Cilicia is 151/2 parasangs, with 3 stations. Separating Cilicia from Armenia is a river the Euphrates, which has to be crossed in a boat, and the distance across Armenia itself is 561/2 parasangs, with 15 stations or stopping-places. Here, too, there is a guard. Through this part of the country 4 rivers run, all of which have to be crossed by a ferry; the first is the Tigris; the second and third both have the same names- Zabatus- though they are different rivers and flow from distinct sources, one rising in Armenia, and the other in Matiene; the fourth is the Gyndes- the river which Cyrus once split into 360 channels. Leaving Armenia and entering Matiene, one has 137 parasangs to go, with 34 stations, and, passing from thence into Cissia, another 421/2 with 11 stations, which bring one to the river Choapses – another navigable stream- on which the city of Susa stands. Thus the total number of stations, or posthouses, on the road from Sardis to Susa is 111. This route has been examined by many researchers and is well documented. It is written this time as a journey from west to east, which we perhaps are more familiar with. Now travelling from east to west in the text and leaving Asia, we reach Europe, and the simplest of the distances to investigate, those which are in fact Roman Road measures10. From Brindisi to Rome there is one route, the Via Appia, or Appian Way. This route was in fact shortened in later years. The original Via Appia from Rome to Brindisi was 365mpm. But the revised route, the Via Apia Traiana reduced the travel; distance to 337mpm. 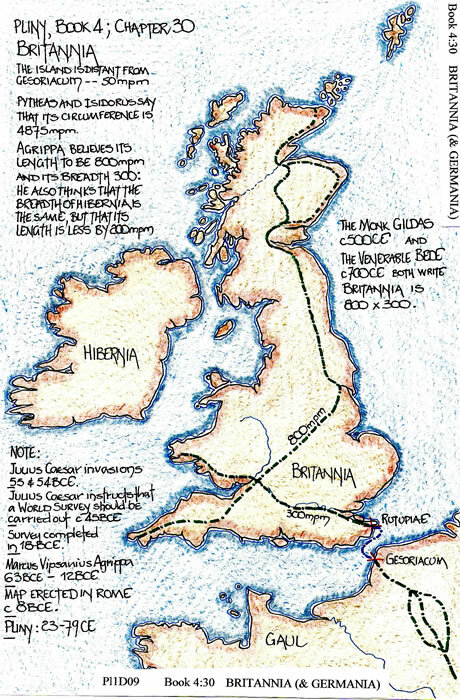 The later Pilgrim’s route totals 363mpm for the same journey. Thus the distance given in Pliny’s text of 360mpm is in all probability the accepted route mileage. From Rome to Gades we are fortunate to have a complete itinerary engraved upon a Poculum, or drinking cup. The total is given as 1842mpm. The total in Pliny’s text is 1777mpm, but his reference point is the Pillars of Hercules, called Gades, and not the city of Gades or Cadiz, which is some mpm further. We may therefore infer that Pliny used actual itinerary measures for the distances set down in his text. However, the actual total is reasonably correct, but the subdivision at “Illiberis at the Pyrenees, 927mpm” is certainly not. This is a conflation of the passage by various scribes in confusing the Illiberis of Gallia Narbonensis with the Illiberis of Baetica, Iberia. In the above text and comments and as shown by the diagrams, Pliny has described the length or longitude of the oikoumene. Note; Following the Greek metaphysical requirements of proportion for the length of the oikoumene, of 2:1, if the length is 8568, the breadth would be 4284, and, if 8945 it would be 4472.5 mpm. I have indicated in my texts Es1 and Es2, (along with Cp3), that the Eratosthian Stadion was 0.1575Km. The Roman world was 75 mpm per degree of latitude, and thus 27000 mpm circumference or 216000 Roman stadia. I find it hard to accept that a man of Pliny’s status and learning would not know of the Roman system and its world measurement particularly as he quotes from Agrippa’s texts at length. But, the sentences following the above text illustrate that Pliny was perhaps more interested in quoting the geographers he so lauds in his text rather than analysing the units utilised by them and recognising the contradictions there-in. The following text is; “Dionysodorus is certainly less worthy of confidence; — he was a native of Melos—- he died of old age there.” Paraphrased now — relatives found an epistle in his tomb stating he had descended to the lowest part of the earth, “a distance of 42000 stadia”. “Hence the estimate has been made that it is 252000 stadia in circumference”. 3 x 2 x 42000 = 252000 stadia. But in Book 2, Chapter 21, “Of the dimensions of the world”, Pliny has shown he was aware of the PI ratio, 22/7, and thus I believe he is merely copying and not editing for correctness the texts of others. Pliny has also clearly stated that Eratosthenes calculated the circle of the earth as 252000 stadia and would surely have calculated a radius using the correct PI ratio, he was an eminent mathematician. Thus we can delimit Europe and Africa. Europe extends from the Straits of Gibraltar to the River Don (Tanais) which flows into the north-eastern corner of the Sea of Azov, the Palus Maeotis of old. Africa extends from the same Straits to the River Nile. Asia extends from the River Nile in the South and possibly from the River Don in the North to form its Western limits, then as far as the River Ganges in the East. The Ganges was the limitation set on the oikoumene by Eratosthenes, although he did add an extra 2000 stadia thus encompassing the capes of India or the delta of the Irrawaddy River at Maudin San (Es1). This ensured he retained the metaphysical ratio of longitude to latitude required by Greek philosophical thought, of 2:1. The bay referred to is none other than the northern Mediterranean Sea comprising gulfs and Seas. Thus from the Straits of Gibraltar curving along the coast of Spain the first is the Gulf of Valencia, and then the Gulf of Lyon, to the Ligurian Sea, and the Gulf of Genoa. Following along the coast of Italy there are several gulfs before we reach the Toe, Calabria as is, and its southern coastline, and the Promontory of Bruttium. There is a measurement text later in the books of Pliny. It would appear that these boundaries having been set in the far distant past have been repeated and although shown to be outdated, adhered too. But the distance measures tell another story. M Agrippa has also stated the whole length of this province to be 475mpm, and its breadth 257: but this was at a time when its boundaries extended to Carthage, a circumstance which has often caused great errors in calculations; which are generally the result either of changes effected in the limits of provinces, or of the fact that in the reckoning of distances the length of the mpm has been arbitrarily increased or diminished. In some parts too the sea has been long making encroachments upon the land, and in others again the shores have advanced: while the course of rivers in this place has become more serpentine, in that more direct. And then, besides, some writers begin their measurements at one place, and some at another, and so proceed in different directions; and hence the result is, that no two accounts agree. That whole paragraph sums up the problem nowadays when even Pliny quotes several geographers and does not inform us of the co-relationship of the various measures quoted. Add to that the fact that there was an inconsistency in the measures, particularly the Stadion and evaluating the data becomes rather a stressful task. At the present day the length of Baetica, from the town of Castulo, on its frontier, to Gades is 250mpm, and from Murcia, which lies on the sea-coast, 25mpm more. The breadth, measured from the coast of Carteia, is 234mpm. Who is there that can entertain the belief that Agrippa, a man of such extraordinary diligence, and one who bestowed so much care on his subject, when he proposed to place before the eyes of the world a survey of that world, could be guilty of such a mistake as this, and that too when seconded by the late emperor the divine Augustus? For it was that emperor who completed the Portico which had been begun by his sister, and in which the survey was to be kept, in conformity with the plan and descriptions of M Agrippa. Thus we can assume that Pliny actually saw and studied the “survey” and his descriptive prose owes a great deal to its portrayal of the “world”. Moesia is basically Serbia and part of Bulgaria, with Illyricum being Istria above Dalmatia now in Croatia. The distance from the Arsia to the Drinius and thence to the Acroceraunian promontory, now Kepi I Gjuliezes in Albania, north of Corfu Island, can be measured in any atlas. The whole sea is now known as the Adriatic with the Gulf of Venice and the Gulf of Trieste at its northern extremity. It is possible to confirm some of the distance measures, but it is not practical to try to determine the limits of the gulf for this text. These distance measures are too nebulous to warrant investigation. On diagrams cgPl1D03 and cgPl1D04 I have added the coast of Germania to illustrate the overall knowledge gained by the Roman conquest of north-west Europe. In my text, “When Rectangle superseded triangle, Tp1”; “Br1, When was Britannia a rectangle?” and “Br2, Between Ptolemy and Bede just where is Ireland?” I have endeavoured to resolve the various textual descriptions afforded to Britannia. It must be noted that Agrippa’s knowledge probably came from the “world” survey requested by Julius Caesar which was completed in 18BCE. The resultant of that survey was that first Agrippa, then his sister Vipsanius Polla, and finally the emperor Augustus himself, saw the data transformed into a map which was displayed in Rome c7BCE. This map was seen and used by Pliny as has been pointed out in his text of Book 3:3, Baetica. The text “StM1, With Michael from Italy to Ireland” fully explains the survey and its aftermath. Britannia was given dimensions which were not mere guesses. Although the Romans did not occupy the majority of Britannia until c100CE, from the time of the invasions of 55 & 54 BCE there was continual trade and travel which provided adequate information from the itinerant population. 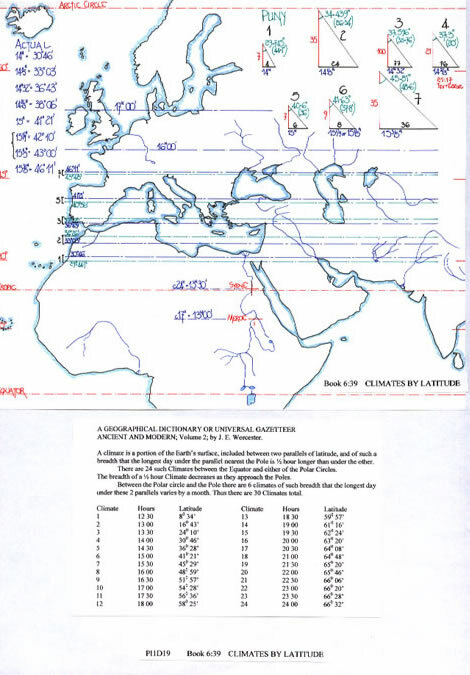 This measurement as written, 8214 miles must be suspect given that the length from the Pillars to the Ganges is either 8568 according to Artimedorus or 9818 according to Isidorus (Book 2 chapter 112). Thus having set out the itinerary route from Tanais to Gades it measures c4750 Km and is thus 3214 Roman Miles, hence the scribal error is confirmed. Within the “Itinerarium Antonini” 10 various road lengths are listed. The distance of “Italy to the Alps” is three sections, Ad Columnan the toe of Italy to Mediolano/Milan, 956mpm. From Milan to Brigantia on Lake Constance or the Bodensee is 138mpm, a total of 1094mpm. 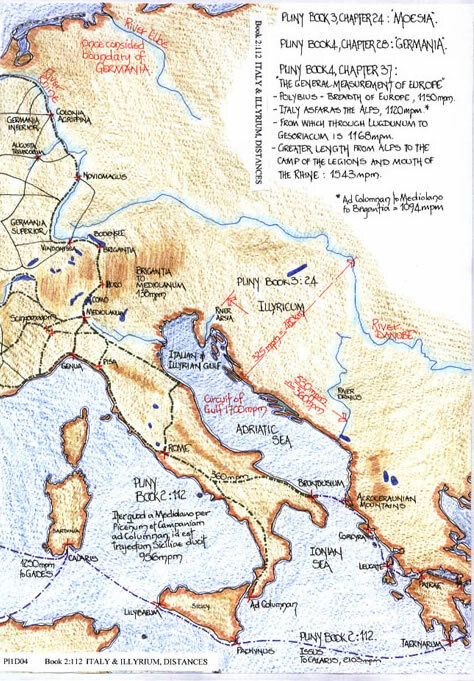 From Brigantia to the Mouth of the Rhine is another route, and from Milan to Lugdunum/Lyon and on to the port, Gesoriacum, another road route. There are alternatives for most routes, but in general the distance measures provided by Polybius are very reasonable, and it serves no purpose trying to identify them individually at this juncture. “After passing the last (Albania/Iberia 6/11), we come to the Gates of the Caucasus, by many persons most erroneously called the Caspian Passes; a vast network of nature, which suddenly wrenched asunder in this place a chain of mountains. At this spot are gates barred up with beams shod with iron, while beneath the middle there runs a stream which emits a most fetid odour; on this side of it is a rock, defended by a fortress, the name of which is Cumania, (probably Daryell )erected for the purpose of preventing the passage of the innumerable tribes that lie beyond. Here then we may see the habitable world severed into two by a pair of gates; they are just opposite Harmastis, a town of the Iberi”. Webster’s Geographical Dictionary13, pages 226/315/316 and 326 lists these passes. Not only is there confusion regarding the “Gates”, but also the actual Caspian or Hyrcanian Sea. Agrippa appears to be describing a minor Sea, 480mpm in length and 290mpm in breadth; i.e. 700 x 500 Km. However, the Caspian Sea is in fact approximately 1175 x 500 Km or 800mpm x 340mpm. Text cgAr1 has a full explanation of this confusion. Eratosthenes appears to understand its size, but does not mention its near neighbour, the Aral Sea. He gives the mouth of the Zonus or Oxus and the mouth of the Jaxartes distance measures, but, both are in fact discharging into the Aral Sea. This is the Sea between Kazakhstan and Uzbekistan and possibly derives its name from the Kyrgyz or Kazakh word “Aral” meaning Island, as the sea contains (or did) over 1000 islands! Thus there is a conflation of both Seas into one. A glance at the later work of Marinus/Ptolemy confirms this. In fact it does not appear until after their influence upon maps has waned in the 15thC. “Like the Gyndes, which Cyrus divided into 360 channels, the river Araxes (Pliny 6:10) rises in the country of the Matieni. It has 40 mouths, all but one issuing into swamp and marshland, —- by the remaining mouth it flows clear into the Caspian Sea. The Caspian is a sea in itself and has no connexion with the sea elsewhere—-. The Caspian, however, is quite separate; in length it is a 15 days’ voyage, using the oars, and it is 8 days’ voyage across its broadest part. Along the west of it stretches the chain of the Caucasus, the longest and loftiest of all mountain ranges, inhabited by many different tribes—–. “The river Cyrus takes its rise in the mountains of the Heniochi, by some writers called the Coraxici; the Araxes rises in the same mountains as the river Euphrates, at a distance from it of 6 miles only; and after being increased by the waters of the Usis, falls itself, as many authors supposed, into the Cyrus, by which it is carried into the Caspian Sea”. The river Cyrus, now the river Kura, and the river Araxes, now the Araks, fall into the Caspian Sea south of Baku and the 40th parallel. The Aras/Araks/Araxes rises in the mountain area between the two upper reaches of the Euphrates and it passes north of the mountain Agri Dagi, better known as Mount Ararat. If the distance had been nearer 60mpm then the description would have been excellent. But where is the Aral Sea and how did the conflation occur? A text cgAr1 discusses this. (A) Gazae as its chief city, distant from Artaxata 450 miles and the same from Ecbatana in Media to which country Atropatene belongs. There is great confusion within the distance measures quoted above. 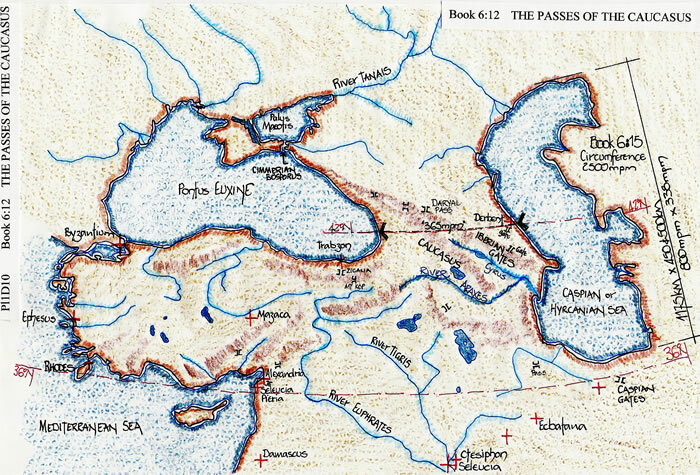 Ecbatana is midway between Seleucia and the Caspian Gates, as the diagrams illustrate. Herodotus states that Ecbatana was built fortified by concentric walls, seven in number, and that the circuit of the outer wall was similar in size to that of Athens itself. 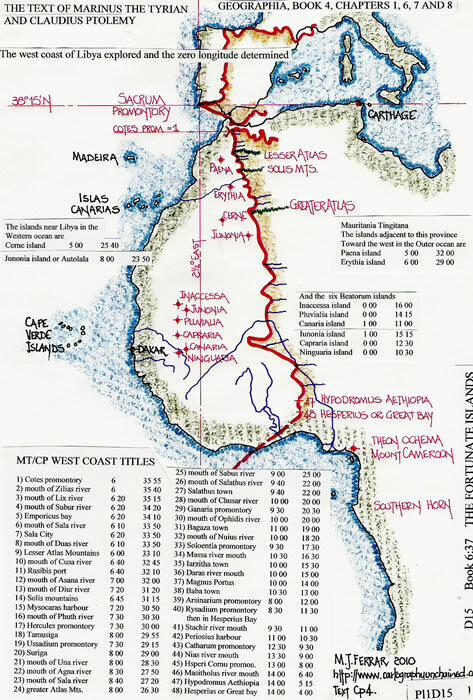 The route taken by Alexander the Great14 is indicated upon diagram cgPl1D12. Unfortunately the measurements given above are also inconclusive. 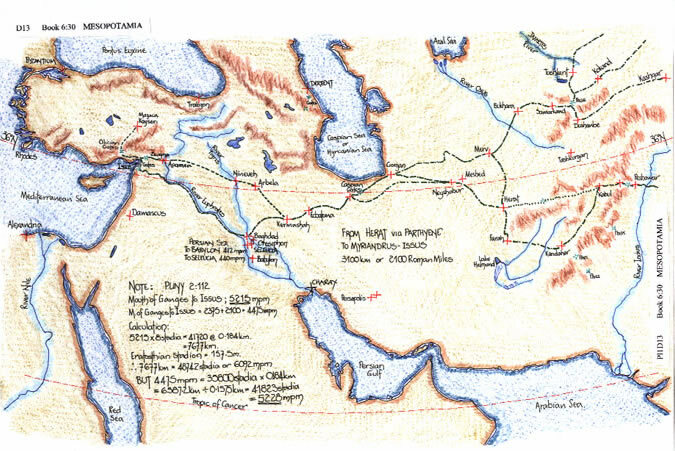 The route taken by Alexander the Great is quite circuitous and thus meaningless in terms of a geographical measure. In fact in 6:21 Pliny sets down the inter-distances from the Caspian Gates, which total 1697mpm. The river Jaxartes is the furthest point east (north) that Alexander achieved and the city of Alexander Eschate is situated there. Thus we have insufficient data to determine the geography because of the missing Aral Sea. “But we come now to nations as to which there is a more general agreement among writers. Where the chain of Emodus rises, the nations of India begin, which borders not only on the Eastern Sea, but on the Southern as well, which we have already mentioned (6;14) as being called the Indian Ocean. That part which faces the east runs in a straight line a distance of 1875 miles until it comes to a bend, at which the Indian Ocean begins. Here it takes a turn to the south, and continues to run in that direction a distance of 2475 miles, according to Eratosthenes, as far as the river Indus, the boundary of India on the west. Many authors haven represented the entire length of the Indian coast as being 40 days’ and nights’ sail, and as being, from north to south, 2850 miles. Agrippa states its length to be 3300 miles, and its breadth, 2300. Posidonius has given its measurement as lying from north-east to south-east, placing it opposite to Gaul, of which country he has given the measurement as lying from north-west to south-west; making the whole of India to lie due west of Gaul. Hence, as he has shewn by undoubted proofs, India lying opposite to Gaul must be refreshed by the blowing of that wind and derive its salubrity there-from. The text of Eratosthenes as recorded by Strabo concerning India and its distance measures has been fully covered in text Es1. The measurements of India vary wildly in Pliny’s text and as we are not given precise points, any meaningful examination here is not possible. 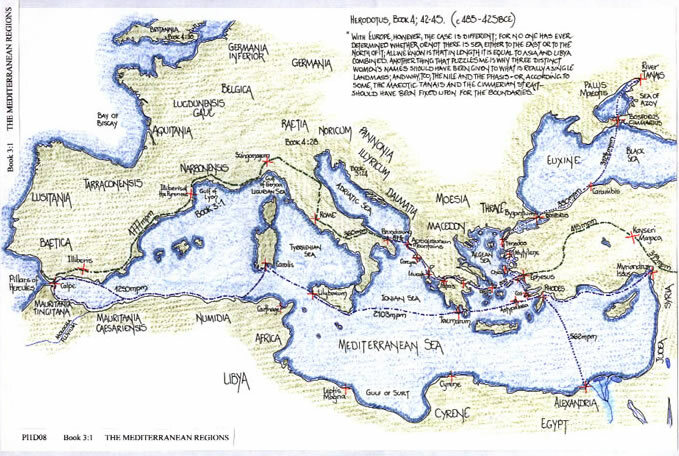 Here Pliny adds yet again a series of distance measures according to the track of Alexander’s expedition. They would be better discussed separately but are included as per the original text. “The remaining distances beyond the above point were ascertained on the expedition of Seleucas Nicator. They are, to the river Sydrus, 168 miles; to the river Jomanes, the same; some copies however , add to this last distance five miles; thence to the Ganges, 112 miles; to Rhodapha, 569 – though according to some writers, this last distance is only 325 miles; to the town of Calinipaxa, 167, according to some 265; thence to the confluence of the river Jomanes and Ganges, 625, most writers, however, add 13 miles to this last distance; thence to the city of Palibothra, 425- and thence to the mouth of the Ganges, 637 ½ miles”. 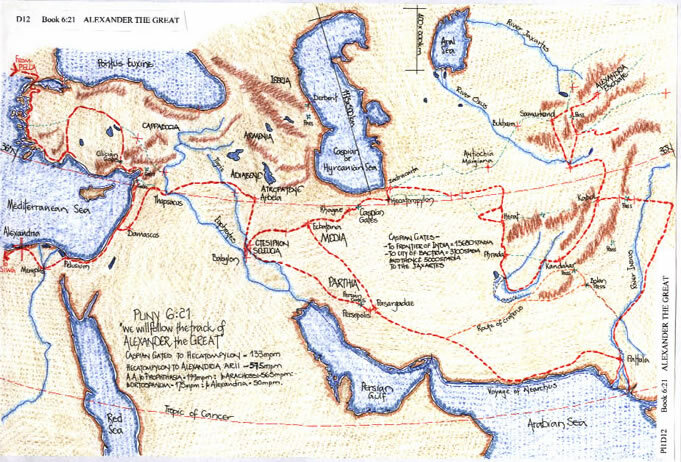 The track of Alexander the Great across Asia to India and the furthest most parts has been discussed in a multitude of texts. The individual place names have been identified. The bibliography includes several of these texts to enable an in depth study to be made of Pliny’s text. “Eratosthenes has also given the dimensions of this island, as being 7000 stadia in length, and 5000 in breadth; he states also that there are no cities, but villages to the number of 700. It begins in the Eastern Sea and lies extended opposite to India, east –west. This island was in former times supposed to be 20 days’ sail from the country of the Prasii, but at later times, whereas the navigation was formerly confined to vessels constructed of papyrus with tackle peculiar to the Nile, the distance has been estimated at not more than 7 days’ sail, in reference to the speed which can be attained by vessels of our construction. We learned also that the nearest point of the Indian coast is a promontory known as Coliacum, distant from the island 4 days’ sail, and that midway between then lies the island of the Sun. The island of Taprobane has been the subject of many texts. Undoubtedly it was originally Sumatra, as texts Es1, Es2 and Cp3 indicate. However in later ancient texts it is moved closer to the southern cape of India and then becomes Ceylon/Sri Lanka; which island was originally thought of as part of India and formed the southernmost Cape with a large bay either side. However it is worth recording the following text to be found upon the map of Johannes Ruysch15, 1507, where he places Taprobane along the Golden Chersonesus, i.e. 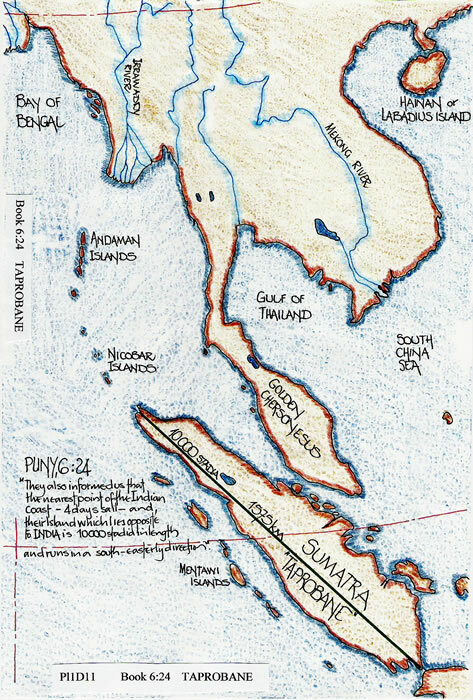 as Sumatra is geographically. My first comment is thanks to Bill Thayer for sorting out the translation, which for me proved a little problematical. It seemed to me a very diverse set of comments for a world map. However, it does confirm that Sumatra was considered to be Taprobane. My texts Cp1 to Cp4 discuss this point. 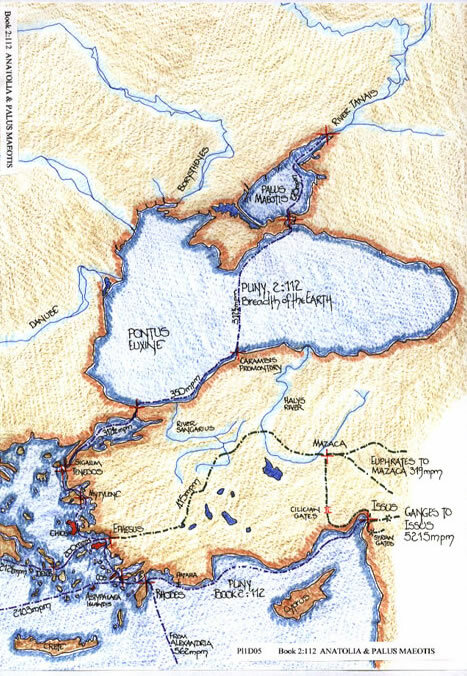 “Persis itself, looking towards the west, has a line of coast 550 miles in length”. The information given above is taken from the texts regarding the conquest and return route of the Army and Navy of Alexander the Great. Therefore previous comments equally apply. 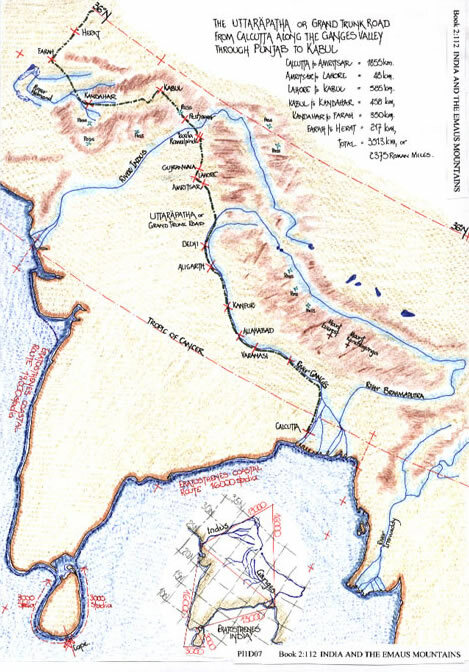 The diagram illustrates the campaign trail of Alexander and the voyage of Nearchus16 along the southern shore-line. A calculation shown on the diagram illustrates that there is a mixture of Stadion lengths used. Pliny in selecting the data he is to give at each point or chapter is inadvertently mixing those lengths. The circumference of Arabia is a creditable 4000/4666mpm, i.e. 5900 to 6900 Km, being in the order of 6300 Km. I do wonder however if the constant translation of the original stadia measures to mpm., has not introduced many errors into Pliny’s text. This text dates from the middle of the 1st century CE. It is Greek text describing the ports to be found whilst trading along the Red Sea, the coast of Northeast Africa and the south coast of Arabia across to the East coast of India. It does not contain distance measures as such but sailing periods which can be assessed. Most of the ports have been identified, but there is still confusion with the final ports on the coast of East Africa. There are numerous scholarly texts available discussing its contents. “The Phoenicians sailed from the Red Sea into the southern ocean—- and after two full years rounded the Pillars of Hercules”. 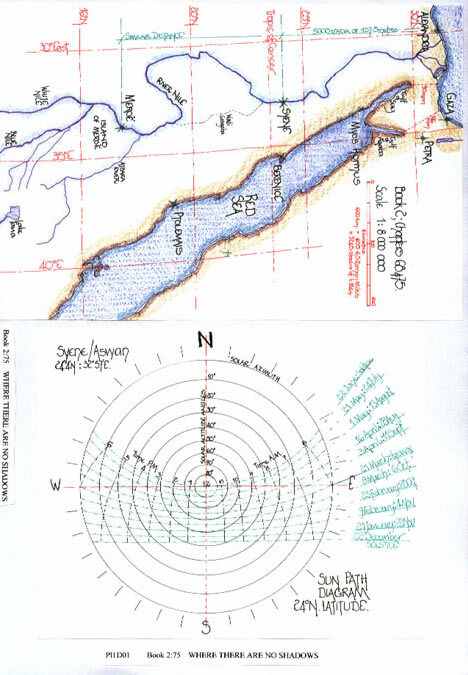 The river Nile and its distance measures are explained in text Es2. The distances quoted here are mis-copied. Whether this is a translation to mpm of stadia measures is questionable, but the City of Meroe, the ancient capital of the Ethiopian King’s is situated only 45Km or 30 mpm northeast of Shendi and the junction of the Blue Nile and Atbara river, the beginning of the island of Meroe is only 35Km or 24mpm, northeast of Meroe City. The 70 mpm equates to 103Km using the stadion of 0.184KM, but, using a stadion of 0.1575 Km it is 88Km and thus indicates a confusion of the Stadia yet again. “We learn from Ephorus, as well as Eudoxus and Timosthenes, that there are great numbers of islands scattered all over this sea; Clitarchus says that king Alexander was informed of an island so rich that the inhabitants gave a talent of gold for a horse,———. 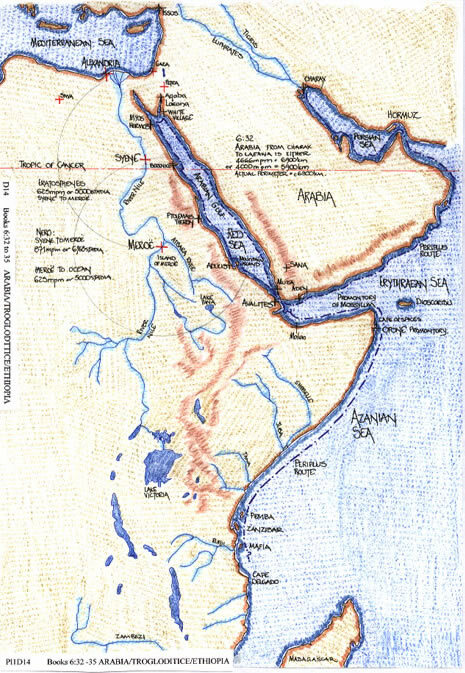 Ephorus states that those who sail from the Red Sea into the Aethiopian Ocean cannot get beyond the Columnae there, some little islands so called. Polybius says that Cerne is situate at the extremity of Mauritania, over against Mount Atlas, and at a distance of 8 stadia from the land; while Cornelius Nepo states that it lies very nearly in the same meridian as Carthage, at a distance from the mainland of 10 mpm, and that it is not more than 2 mpm in circumference. It is said also that there is another island situate over against Mount Atlas, being itself known by the name of Atlantis. Five days’ sail beyond it there are deserts, as far as the Aethiopian Hesperiae and the promontory, which we have mentioned called Hesperu Ceras, a point at which the face of the land first takes a turn towards the west and the Atlantic Sea. Facing this promontory are also said to be the islands called the Gorgades, the former abode of the Gorgons, two days’ sail from the mainland, according to Xenephon of Lampsacus. Hanno, a general of the Carthaginians, penetrated as far as these regions, and brought back an account that the bodies of females were covered with hair, but that men, through their swiftness of foot, made their escape;—–. Beyond these even, are said to be two islands of the Hesperides; but so uncertain are all the accounts relative to this subject, that Statius Sebosus says that it is 40 days’ sail, past the coast of the Atlas range, from the islands of the Gorgons to those of the Hesperides, and one days’ sail from theses to the Hesperu Ceras. Nor have we certain information relative to the islands of Mauritania. We only know, as a fact well-ascertained, that some few were discovered by Juba over against the country of the Autololes, upon which he established a manufactory of Gaetulian purple. The last named indicates possibly the Purpuriae or Purple Islands of the Madeira group, but, we must be careful, as the Phoenicians developed the purple colour from a mollusc and had islands near Sicily with kilns and production centres. In fact they had many such centres throughout the Mediterranean. The over-riding sense taken from the foregoing text is that there are two sets of islands in the Atlantic Ocean west of the coast of Libya/Africa. This could account for the problems which are discussed in the following chapter. The diagram illustrates the text of Marinus/Ptolemy and sets out the main geographical data available illustrating the two sets of islands. There are some authors who think that beyond these (6,36 Islands of the Aethiopian Sea) are the Fortunate Islands, and some others; the number of which Sebosus gives, as well as the distances, informing us that Junonia is an island 750 miles distant from Gades. He also states that Pluvialia and Capraria are the same distance from Junonia, to the west; and that in Pluvialia the only fresh water to be obtained is rain water. He then states at a distance of 250 miles from these, opposite the left of Mauritania, and situate in the direction of the sun at the eighth hour, are the Fortunate Islands, one of which, from its undulating surface has the name of Invalis, and another that of Planasia, from the peculiarity of its appearance. He states also that the circumference of Invalis is 300 miles, and that trees grow to a height of 114 feet. Relative to the Fortunate Islands, Juba has ascertained the following facts; that they are situate to the south in a nearly westerly direction, and at a distance from the Purple Islands of 625 miles, the sailing being made for 250 miles due west and then375 towards the east. First Island called Ombrios, has no buildings, but a lake, trees and giant fennel from which water is extracted. Second Island called Junonia has a small temple of stone and a nearby island of the same name. Fourth Island is Ninguaria, with its perpetual snows and fogs. The naming of these Islands has led to an enormous number of texts being written. Generally it is the etymological argument regarding the names attributed to them which leads to confusion. For instance, Ninguaria is from the Latin, ningit, “it is snowing”; but, Capraria is derived from the Latin, caper or capra, meaning Goat, a lizard is lacerta in latin. Others make little sense in Latin. Many researchers use the later names to be found in the texts of Marinus/Ptolemy. But these are some 100 to 150 years after the references given by Pliny. It should also be noted that the actual Canary Islands were populated by a peoples known as the “Guanches”, who were, from the historical and archaeological record, civilised and possibly derived from the Berbers of Mauritania, the mainland opposite. Unfortunately the Spanish invaders wiped out this population much the same as in South America. The diagram sets out the argument for the correct naming and positioning of the Fortunate Islands as The Cape Verde Group as text Cp4 illustrates. Having now fully described the earth, both without as well as within, it seems only proper that we should succinctly state the length and breadth of its various seas. Polybius has stated, that in a straight line from the Straits of Gades to the mouth of the Maeotis, it is a distance of 3437 ½, and that, starting from the same point the distance in a straight line to Sicily is 1250 miles, from thence to Crete 375, to Rhodes 187 ½, to the Chelidonian Islands the same distance, to Cyprus 225, and from thence to Seleucia Piera, in Syria, 115 miles: the sum of all which distances amounts to 2340 miles. 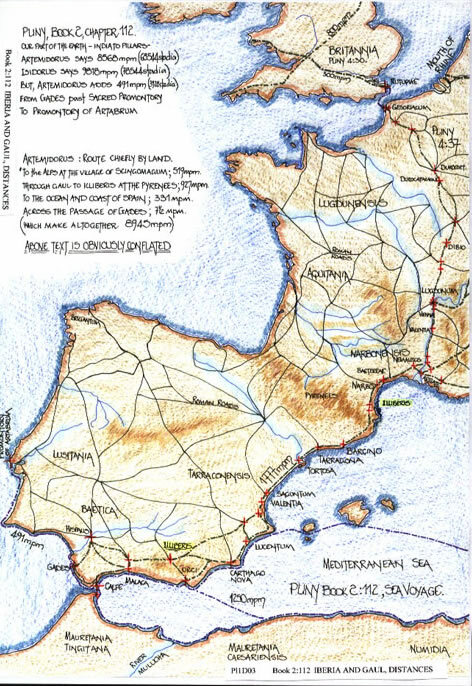 Agrippa estimates this distance, in a straight line from the Straits of Gades to the Gulf of Issus, at 3340 miles, in computation, however, I am not certain that there is not some error in the figures, seeing that the same author has stated that the distance from the Strait of Sicily to Alexandria is 1350 miles. Taking the whole length of the sea-line throughout the gulfs above mentioned, and beginning at the same point he makes it 10058 miles; to which number Artemidorus has added 756; the same author, including in his calculation the shores of the Maeotis, makes the whole distance 17390 miles. Such is the measurement given by men who have penetrated into distant countries, unaided by force of arms, and have, with a boldness that exhibits itself in the times of peace even challenged, as it were Fortune herself. I shall now proceed to compare the dimensions of the various parts of the earth, however great the difficulties which may arise from the discrepancy of the accounts given by various authors; the most convenient method, however, will be that of adding the breadth to the length. Following this mode of reckoning the dimensions of Europe will be 8294; of Africa, to adopt a mean between all the various accounts given by authors, the length is 3794 miles, while the breadth, so far as it inhabited, in no part exceeds 250 miles. 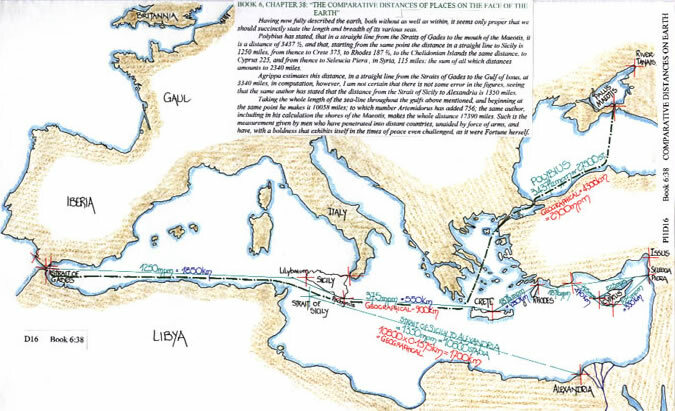 But as Agrippa, including its deserts, makes it from Cyrenaica, a part of it, to the country of the Garamantes, so far as was then known, a further distance of 910 miles, the entire length, added together, will make a distance of 4608 miles. The length of Asia is generally admitted to be 6375 miles and the breadth, which ought, properly, to be reckoned from the Aethiopian Sea to Alexandria near the River Nile, so as to run through Meroe and Syene, is 1875. It appears then that Europe is greater the Asia, by a little less than one half Asia, and greater than Africa by as much again of Africa and one Sixth. If all these sums are added together, it will be clearly seen that Europe is one third, and a little more than one eighth part of one third, Asia one fourth and one fourteenth part of one fourth, and Africa, one fifth and one sixtieth part of one fifth of the whole earth. 1/3 + 1/8 for Europe, then, ¼ + 1/14 for Asia and 1/5 + 1/60 for Africa. 210; apparet ergo Europam Paulo minus dimidia Asiae parte maiorem esse quam Asiam, eandem altero tanto et sexta parte Africae ampliorem quam Africam. Quod si misceantur omnes summae, liquido patebit Europam totius terrae tertiam esse partem et octavam Paulo amplius, Asiam vero quartam et quartam decimam, Africam autem quintam et insuper sexagesmam. Africa; 1/5th plus 1/60th, and these we are told make the whole earth, and will thus total 1 (unity) or 100%. Thus the “little more than 1/8th” must account for the short fall of 0.0036 in the calculation. But, I have used decimals, a methodology the Romans could only dream of whilst using their cumbersome numerical system. The diagrams illustrate by comparison of the distance measures the veracity of the above statements. They also indicate that once more we find a mixture of Stadion lengths used for the Mediterranean distances. The percentage division of the Earth is harder to illustrate. The diagram shows firstly the calculation of the actual land areas from the text. There is one section, Asia for which Pliny gives both length and breadth. Thus we can use that land area to calculate the area of a single percent and thus multiply out the land areas for Africa and Europe. Then, using the limiting places described in the text the diagram can be drawn. This has then been transferred onto the geographical map to illustrate the differences. 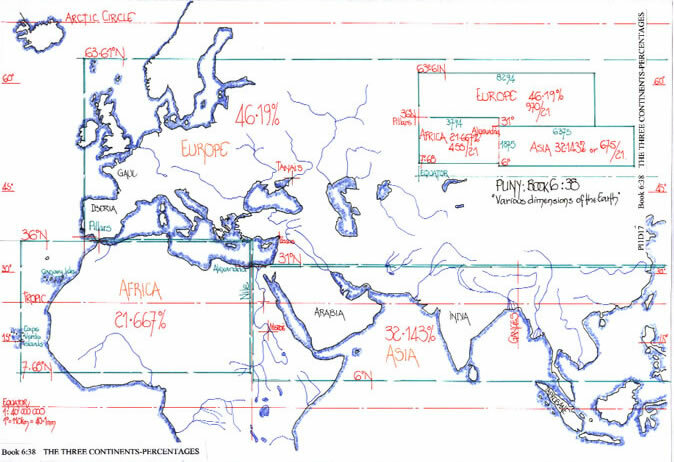 Generally the concept of Pliny for the land areas is upheld by the diagram and map plot, but, it was obviously conceived of on a very different map projection. BOOK 6, CHAPTER 39:” DIVISIONS OF THE EARTH INTO PARALLELS AND SHADOWS OF EQUAL LENGTH”. The first begins at that part of India which looks towards the south, and extends to Arabia and those who dwell upon the borders of the Red Sea. It embraces Gedrosi, the Carmanii, the Perse, the Elymaei, Parthyene, Aria, Susiane, Mesopotamia, Seleucia surnamed Babylonia, Arabia as far as Petra, Coele Syria, Pelusium, the lower parts of Egypt called Chora of Alexandria, the maritime parts of Africa, all the cities of Cyrenaica, Thapsus, Adrumentum, Clupea, Carthage, Utica, the two Hippo’s, Numidia, the two Mauritanias, the Atlantic Sea, the Pillars of Hercules. Within the meridians this parallel, on the middle day of the equinox, the pin of the dial , usually called the gnomon , if 7 feet in length, throws a shadow at mid-day no more than 4 feet long, the longest day and night are 14 equinoctial hours respectively, the shortest being only 10”. “Thus far on the Geography of the Earth.” Thus ends the geographical text of Pliny. 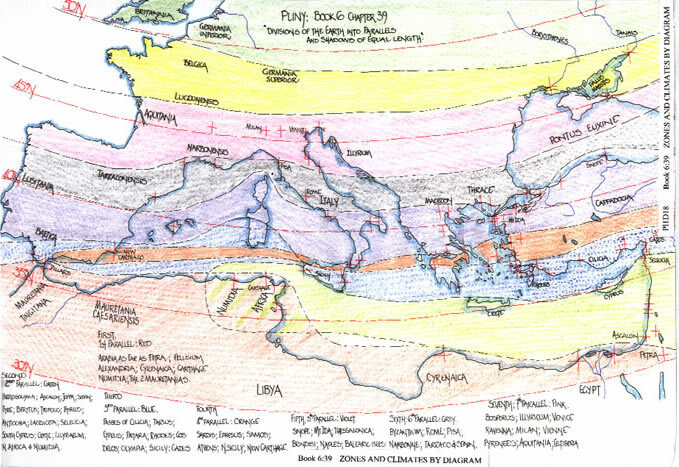 The parallels as described by Pliny and plotted upon a geographical map are rather inter-twined as opposed to the textual inference of horizontal bands across the Earth’s surface. The most obvious reason for the curvilinear shapes is that the map projection is wrong. However it should be noted there is an obvious scribal error in section four where the gnomon is 21 units and the shadow or ombre should read 17 units and not 16 units. i.e. xvii not xvi. The second problem is one of text place names; there are many more in the second parallel than any other. In fact this parallel encompasses the whole latitude of the eastern Mediterranean Sea from Issus to Ascalon, just above Gaza. Geographically that is a 5 degree spread, some 550Km or 370mpm. Thus we must look to a map which reduces the latitudinal measure of this part of the Mediterranean Sea and allows the parts to the north to widen and become similar “parallels”. Or, the text has been wrongly copied. The text Pl2, which will follow this text upon the web-site, investigates the maps provenance. If we compare the “parallels” with the “Climates” of one half hour interval, using the Gnomon Ratios given by Pliny, we can begin to establish the raison d’être for his statements. But we must be aware of the possible error between the third and fourth ratios given, as they appear to be a reversal. The obvious answer is that the fourth ratio is in fact meant to be around c390N, a ratio of 21:17 (or 16:13), both reasonably the mid-point of “parallels 3 and 5”, at c39.1 degrees. And, obviously the original 21:16 ratio given is very probably a scribal error and the 21:17 ratio is correct. Without investigating the map on which these parallels were drawn and with that the veracity of the Poleis or Towns noted as being in that parallel it is impractical to comment further at this stage of the investigation. The following text Pl2 seeks to answer that point. The first and probably most important conclusion is that Pliny re-defined each measurement, however it was originally written in the various texts he used, as a Roman Mile or mpm. However, the one fact he did not ascertain was the original distance measures of each text and if it was therefore capable of being divided by eight, the number of Stadia in a Roman Mile. Thus we have distance measures based upon a Stadion of c157.5m or c185m both being divided by eight to produce a Roman Mile measure. That of course produces a variation from 1.26Km to 1.4791Km or 85% to 100% of the actual length of a Roman Stadion. The second conclusion must be that Pliny merely copied the data he was researching from within other geographers and historians texts, without first verifying or questioning the veracity of that data. He has merely taken their word for the facts there-in. Thirdly the problem with all such texts, that of scribal copying errors. Pliny though has bequeathed to us extracts of texts from other geographers and historians which we would perhaps not otherwise have available. The fact that his text uses the work of Eratosthenes, as does Strabo, and contains some extra information, enables us to use both texts to enhance our studies. Had Pliny actually noted each and every author he was quoting in his History, we may have had an even greater insight. What the text of Pliny does show is that there were dozens of geographers and historians in the Roman and Greek worlds who were trying to increase the overall knowledge of the oikoumene. It also indicates that that overall knowledge was quite awesome and if the texts had survived for our studies then perhaps we would have a slightly different view of the oikoumene. Also, if only the metaphysical and philosophical arguments could have been obviated and the adherence to a world view of zones re-evaluated, I do not doubt that the ancient geographers would have mapped the whole world. The “Naturalis Historia” of Pliny the Elder is a work of immense importance even in the 21st century. 1) Pliny the Elder; Gaius Plinius Secundus, “Naturalis Historia” is on line in both Latin and English translation at; http://penelope.uchicago.edu/thayer and http://www.perseus.tufts.edu. Oxford Classical Dictionary, 3rd edition, 2003 page 1198.
only fragments of his work survive. 3) Isidorus of Charax; “Parthian Stations”. 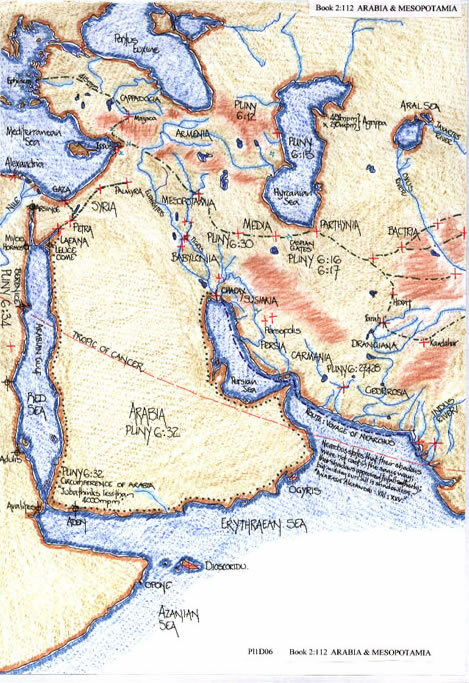 An account of the overland trade route between the Levant and India in the 1st century BCE. The Greek text with a translation and commentary by Wilfred H. Schoff, 1914, London. 4) Eratosthenes; although quoted extensively by Pliny and Strabo his original texts are now lost to us. However we know he was an accomplished mathematician, a correspondent of Archimedes and obviously an accomplished geographer. 5) Strabo: The Geography: available at http://penelope.uchicago.edu/thayer and at http://www.perseus.tufts.edu. Both use the 1924 edition edited by H.L.Jones. 6) The Stadion. Its length has varied from its ancient original, not only from country to country but also within countries. The Dictionnaire universal des poids et mesures anciens, by Horace Doursther, 1840, Brussels. Within “Christopher Columbus, and the age of exploration” which is in fact an encyclopedia pages 228-234 deal with Measurement of Distance and include tabular references to the Greek, Roman and Stadion measures. It includes the variation in the Stadion from 157.5m to 185m. 7) Herodotus;”The Histories”, translated by Aubrey de Selincourt; Penguin Books London. 8) PI. It is the sixteenth letter of the Greek alphabet and signifies the ratio of the diameter of a circle to its circumference. It is a number without end, it cannot be resolved and neither can it very accurately be expressed as a fraction. It has been variously, 3, 22/7, 25/8 and perhaps 256/81. see Blatner, D. 1997, “The Joy of PI”, penguin books, London. 9) “The History of Cartography”, edited by J.B.Harley and David Woodward. University of Chicago Press, 1987. Volume 1, Cartography in Prehistoric, Ancient and Medieval Europe and the Mediterranean. 10) “Itinerarium Antonini Augusti et Hierosolymitanum”, compiled by G. Parthey and M. Pinder, Berolini, Impensis Friderici Nicolai, MDCCCXLVIII. This is a list of the ancient texts which catalogue the Roman Road routes, station by station with the route mileage per section. It also covers maritime routes and the journey to Jerusalem. 11) Agrippa. Tierney J.J., 1963, “The Map of Agrippa”, proceedings of the Royal Irish Academy. Marcus Vipsanius Agrippa, c64BCE-11BCE, Oxford Classical Dictionary, page 1601. 12) Polybius; The Histories; Loeb Classical Library, 1922-1927 and now available at http://penelope.uchicago.edu/thayer, and Oxford Classical Dictionary, page1209. 13) Webster’s New Geographical Dictionary, Merriam Webster inc. New York. “The Campaigns of Alexander”, by Lucius Flavius Arrianus, Penguin Classics, 1971. 15) Johannes Ruysch c1460-1533, cartographer and astronomer who produced a famous map of the world, the second oldest known with a printed representation of the New World, published 1507. 16) Nearchus; Admiral of the fleet of Alexander from the river Indus to Babylon. See, Arrian; Anabasis Alexandri. Book VIII (indica) available at http://www.fordham.edu/halsall. 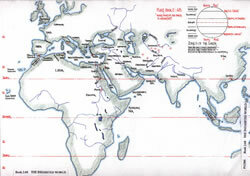 Go to http://www.henry-davis.com/MAPS, for the Ancient Map Web List which covers the period from 6200BCE to 400CE. 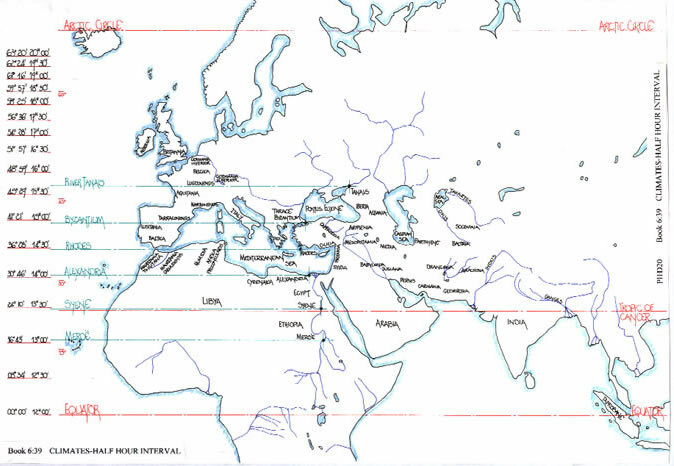 Go to http://www.henry-davis.com/MAPS, for the period from 400 to 1300CE.